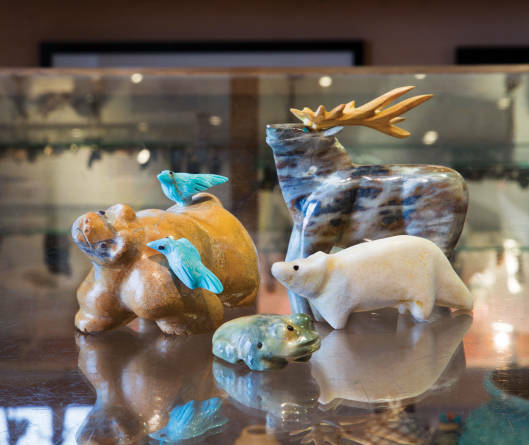 Hayes Leekya&apos;s bear fetish, Enrike Leekya&apos;s elk, Sara Leekya&apos;s white fox, and Delvin Leekya&apos;s frog on display at Keshi, the Zuni Connection in Santa Fe. Photography by Inga Hendrickson. EVERY FETISH CARVED by Zuni artist Freddie Leekya begins with a prayer and an open mind. “You know, we have to say some prayers in order to get the really good rock. We give a little offering to Mother Earth,” he says. It’s just after six in the evening at the Pueblo of Zuni, about 150 miles west of Albuquerque. Freddie has worked his tools against stone since morning, but even after this long day, he is jovial. He laughs easily, a hearty chuckle that rounds out almost every thought. “If we’re lucky enough to find some real good rock, we’ll bring it home, and what we do is let it sit in the house because it’s still kind of wet, and that makes it brittle. But if you let it sit for a day or two, it dries off and becomes solid. Then we start working with it,” he says. “When you work with the rock, it tells you what it wants to be. You’ve just got to have an imagination. It also depends on how you feel—if you’re feeling down, it won’t work that well. If you’re in a good mood, everything pops out right then and there. You go with the rock and see what comes out. For Freddie, what comes out is a menagerie of animal figures known as fetishes. A traditional Zuni art form believed to carry the powers of each individual creature, fetishes depict animals like wolves, badgers, and mountain lions. Each one holds spiritual meaning to the Zuni people and, sometimes, the power to heal. Recently, Freddie has experimented with new forms. From the stones emerge bipedal amphibians wearing shell necklaces, rabbits reading books, and eccentric human figures. They join his more traditional works, most notably frogs, which represent his maternal clan, along with horses, beavers, bears, and other animals. It’s a family affair, this knowledge of carving and its preparatory steps: where to find the rock (a certain type of travertine known as Zuni stone is used exclusively by the Leekya family), how to harvest it, and how to work with it. Freddie learned at the age of 13 or 14 from his father, Francis Leekya. 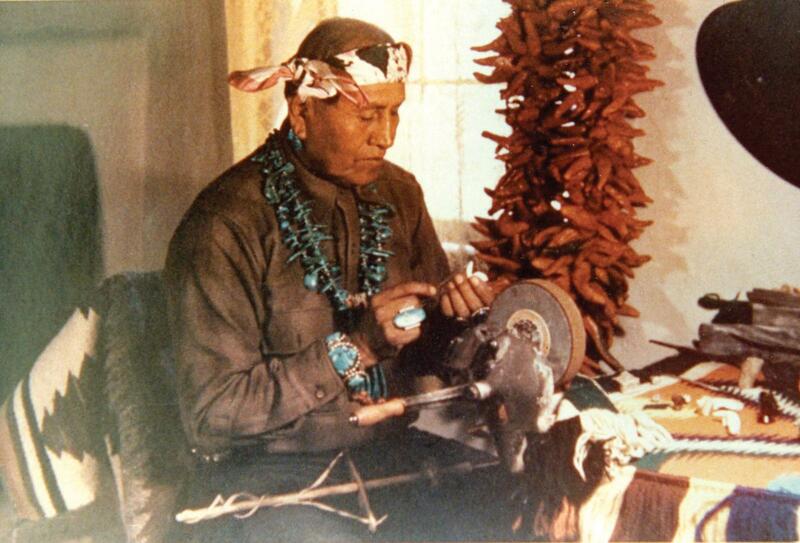 And Francis learned from his father, a fabled figure of his own in Zuni artistry. The style of Freddie’s grandfather, Leekya Deyuse—also known simply as Leekya—may seem traditional now, but he blazed an innovative trail. Originally, fetishes were nothing more than stones that had naturally occurring figurative characteristics. Sometimes they were mildly modified and adorned, then blessed and used only for ceremonies. In the early 20th century, Leekya, along with artists such as Teddy Weahkee and Leo Poblano, began carving fetishes for personal use. C.G. Wallace, a savvy trader who owned the C.G. Wallace Trading Post in Zuni and the De Anza Motor Lodge in Albuquerque, saw a marketing opportunity, and the work of Zuni carvers became a mainstream commercial success. Collectors particularly liked Leekya’s work, not only because of his technical skill but also for the character he imbued within his carvings. A Leekya bear tilts its head to one side and opens its mouth into a wide smile. His frogs, squat and round, beg to be scooped up into your palm. Leekya Deyuse, known simply as Leekya working in his studio in the mid-20th century. Photography Courtesy Albuquerque Museum. Despite Leekya’s popularity and the significance of his legacy, his story remains obscure. There’s little published material concerning the development of his work and the role C.G. Wallace had in its popularity. This prompted Deb Slaney, a curator at the Albuquerque Museum, to tap into her years of research on the collection, beginning with a large portion housed at the Heard Museum in Phoenix. The result is the first comprehensive exhibition of Leekya’s work. Running June 24 through September 24, The Leekya Family: Master Carvers of Zuni Pueblo showcases outstanding examples of Leekya’s work, culled from private collections all over the country and big-name institutions such as the British Museum and the Eiteljorg Museum, along with New Mexico’s own Wheelwright Museum, School for Advanced Research, and Museum of Indian Arts and Culture. The exhibition focuses on the commercial aspect of carving at Zuni Pueblo, which emerged in the early 20th century. By 1910 or 1920, Slaney estimates, Leekya carved bear fetishes that were blessed for traditional uses, before eventually crossing into the commercial market. “He, along with three or four other artists, was part of the birth of a new tradition,” Slaney says. To give a comprehensive look at how his descendants have continued and expanded his legacy, the exhibit includes works by other members of the Leekya family. Like Freddie, those artists proudly nod to tradition while also exploring their own creative impulses by reinterpreting classic subjects. “I think that they are all incredibly reverent of their grandpa and what he gave them,” Fox noted. “Even when they’re doing their innovative work, I get the feeling their grandpa would’ve absolutely loved it.” After all, she pointed out, he was innovative, too.